Betty Goldschlager and Her Daughters Frieda and Estelle: FOUND! 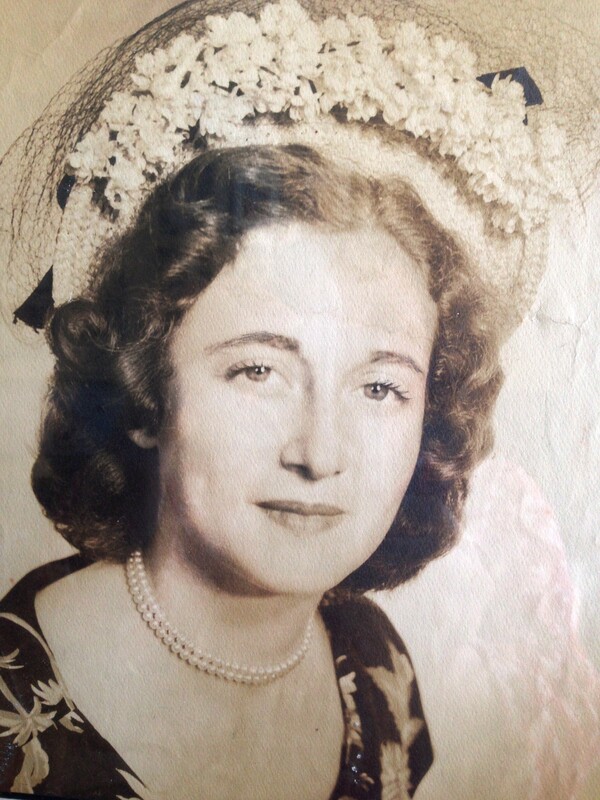 I have written about my grandfather’s younger sister, my great-aunt Betty, and her experiences arriving in New York City the day after her father had died of tuberculosis. But until now I knew very little about her life after those early days. 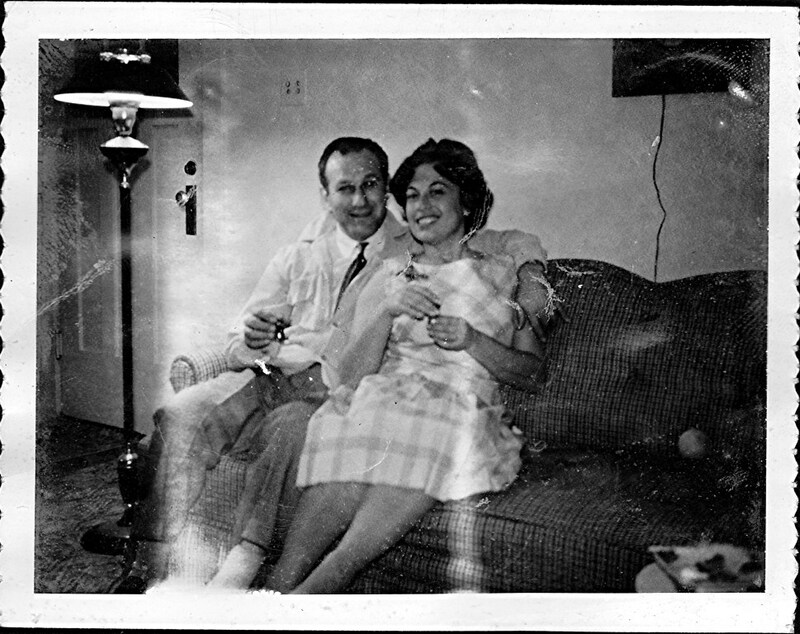 I knew that she had married Isidor Feuerstein, had two daughters Frieda and Estelle, and had moved to Long Island, where Isidor had a dry goods business near Levittown. Most of that I knew from my mother, who has clear memories of her aunt, uncle and cousins visiting her in Brooklyn when she was growing up. My mother commented on what an astute businessman Isidor must have been to have opened a business near Levittown when it was a new community. 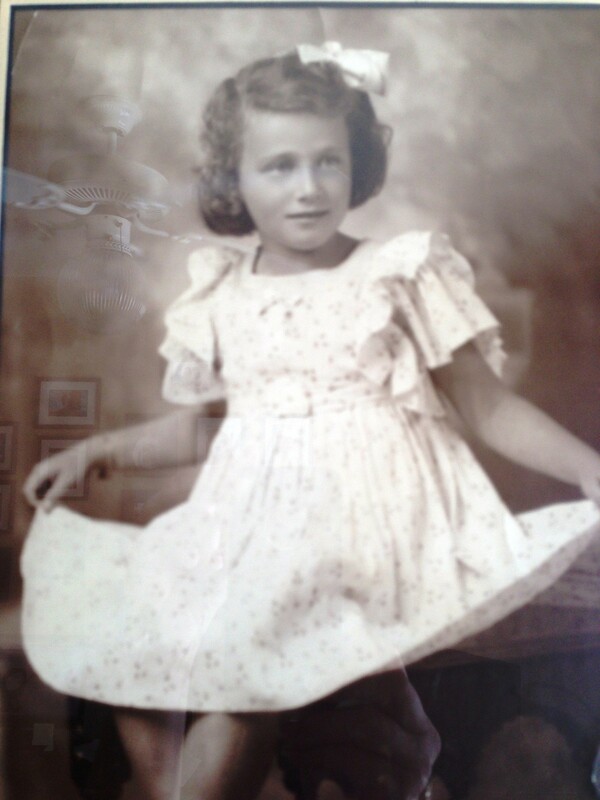 She also remembered that her two cousins were beautiful young women, described by my grandfather as Romanian princesses. But that was all I knew. My mother thought that Betty and her daughters had all moved out west at some point, and she had lost touch with them long ago. My search for them turned up a few details—a death certificate for Betty from Phoenix, AZ, census reports from 1930 and 1940, but little else. Then several months ago, I thought I had a hot lead. 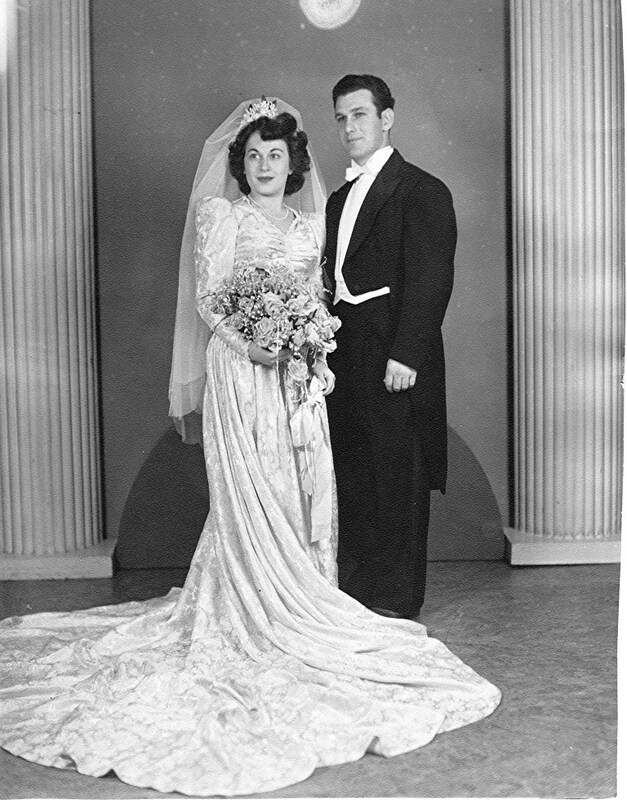 I located a great-nephew of Isidor Feuerstein on ancestry.com, and he knew that Frieda had married a man named Abe Albert and even had a wedding picture of her as well as one taken several years after the wedding. He believed that Frieda had a daughter named Gail, but was not sure. He knew that Estelle had married a man named Kenner with a first name that started with I, but did not know whether she had had any children. He did not know whether either Frieda or Estelle was alive or where they might be living. With that new information, I started searching again, and although I was able to locate an Estelle Kenner living in Pembroke Pines, FL, I had no way to be sure that this was the same Estelle. I could find no real evidence of Frieda. I searched as many different ways and as many different places as I could, but kept hitting that proverbial brick wall. So I moved on, focused on David, Isadore, the Strolowitz family, the Schwartz family, etc. Then the other night I mentioned to Renee (my friend and mentor) in an email that I was still searching for my mother’s two first cousins, Frieda and Estelle. I woke up the next morning, and there in my Inbox was an email from Renee providing me with Estelle’s wedding announcement, her husband’s obituary, and the names of their three children. So after months and months of finding nothing on my own, Renee in one evening had solved one of my most frustrating searches. How did she do it? She had access to yet another database that I was not aware of—something called ProQuest available at certain libraries. 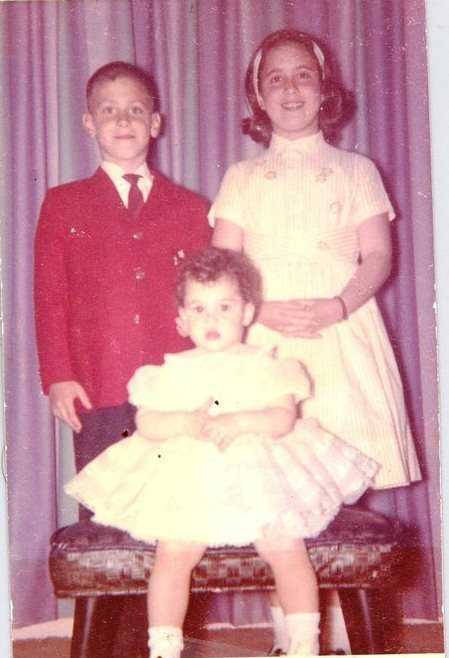 So I was off and running, finding the three Kenner children on Facebook and sending each a message about my research. Within five minutes, Barry Kenner sent me back a message, and we then spent over an hour on the phone, exchanging information and getting to know each other. He also gave me contact information for Frieda’s daughter Gayle, and I have now had several email exchanges with her as well. There is still a lot to learn and more photos and documents to share, but I have answers to many of my unanswered questions. 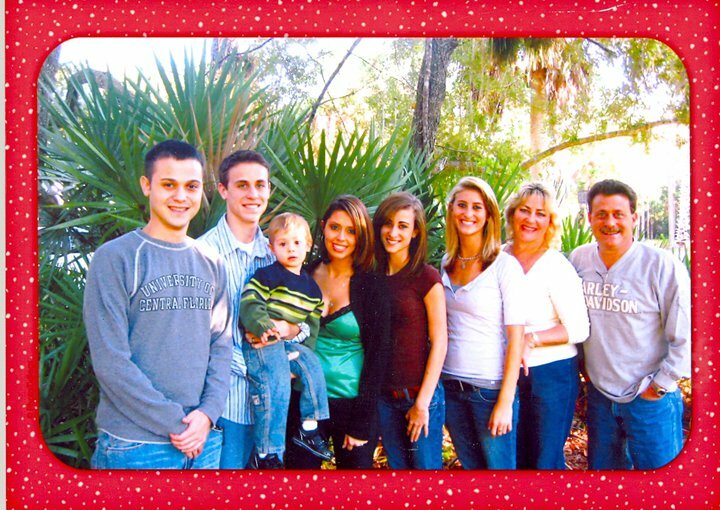 I have also had an email from Barry’s sister Robyn and hope to hear from his other sister Karyn. I have lots of new names to add to the Goldschlager family tree and am awaiting more photographs and information about my family. First, Frieda and Estelle are both still alive. Frieda lives in Arizona, and Estelle in Florida. Both of their husbands ended up in the same fabric importing business as Isidor Feuerstein. Irving Kenner had taken over the Long Island business, and Abe Albert started his own business in Arizona. 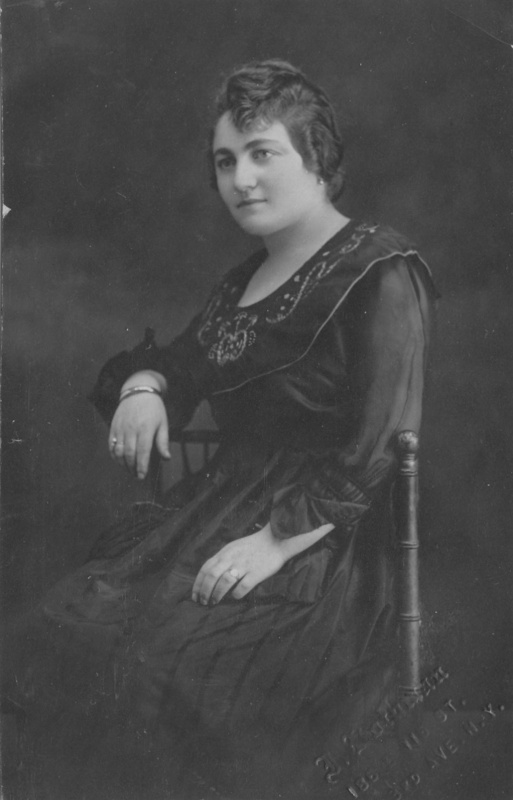 Frieda and Estelle each had three children—two sons and a daughter for Frieda, two daughters and a son for Estelle. There are also many grandchildren and great-grandchildren descended from Betty and Isidor. I assume this was taken in Iasi, not New York. I can see why Betty described her father as dapper. His clothing, his watch chain, the stance, the mustache, the furniture behind him—all this gives me a far different impression of the man who was my great-grandfather than I had imagined. Somehow I saw him as a peddler, a poor immigrant, because that was what he was in New York, but perhaps their life in Iasi was far more comfortable than I had assumed. Gayle also said that her grandmother talked about having a tall brother whom she referred to as Uncle Gadalia. I told her that that must have been David, since Isadore was not tall at all. 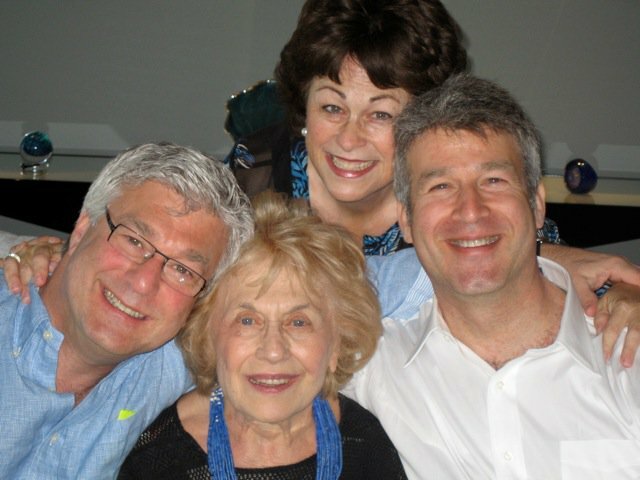 She also remembered that she had met David’s son Murray and his wife when they came to Phoenix from Tucson for her brother’s bar mitzvah, but that they lost touch after that. Barry recalled visiting his grandmother on Long Island and her house with the grand entry staircase that they would slide down as children, using her silk pillows as seats. He described Betty as a sweet and petite woman whom he recalls making them mashed potatoes with chicken fat instead of butter. It’s amazing how little stories, little memories can bring alive someone whom I never knew. 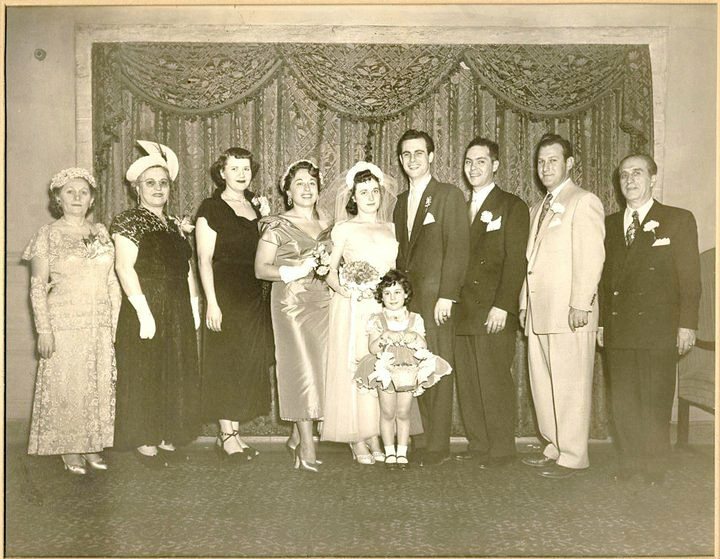 Barry shared this picture of the Feuerstein family at his parents’ wedding in 1951. Betty, Isidor and their daughters and some pictures that Barry shared with me through his Facebook page and some that Gayle sent me. I am excited to see others and to learn more about these newly discovered cousins. 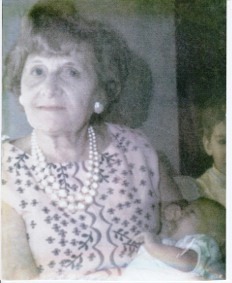 Who was Tillie Srulowitz? Another mystery solved? Isadore and David Goldschlager: More than Brothers? 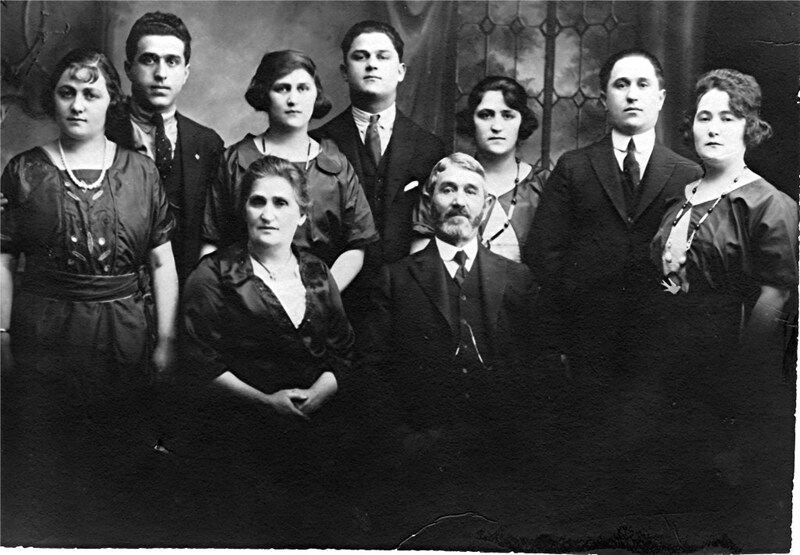 This entry was posted in Genealogy, Goldschlagers, Miscellaneous information and updates, Photos, Romania and tagged David Goldschlager, Family, goldschlager, Photos, Romania by Amy. Bookmark the permalink. Wow Amy. This family keeps growing and growing. You must have been so excited to get this news. Loved the picture of our great grandfather. He did look dapper. Yes, very excited! And that picture is a classic. Who would have thought our great-grandfather would have been so sophisticated looking! Amy this is amazing. That picture of our Great Grandfather is surreal. Like Jody said our family just jeeps growing and growing. This has been very exciting for all of us. Keep looking. I always look forward to your next discovery. Thank you, Robin! It just gets to be more and more rewarding doing this. For our new Goldschlager cousins, if you are reading the comments, Jody and Robin are my first cousins, also grandchildren of Isadore and Gussie Goldschlager, and thus also your second cousins! Thank you for this posting – quite interesting information – great work on the research! I love the photos especially the one of Moritz Goldschlager looking quite dapper! Keep up the great work and I look forward to future postings! Glad you enjoyed it, Richard! Have you ever heard your grandfather David referred to as Gadalia? And just how tall was he? 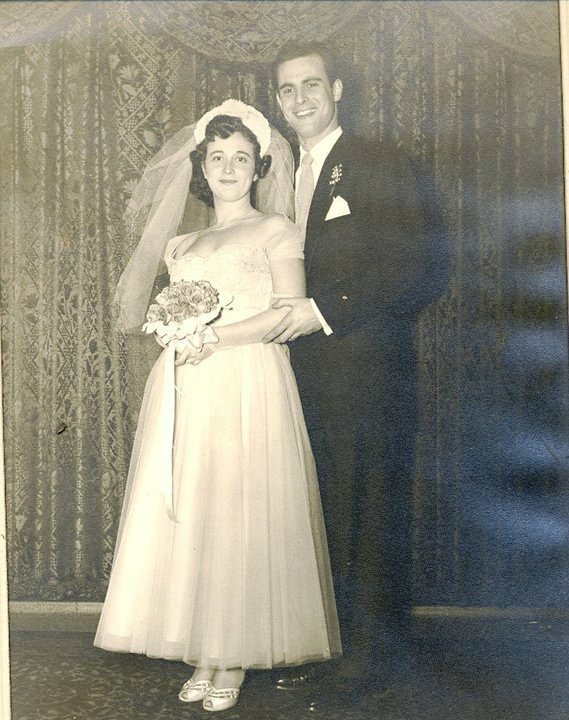 Since my grandfather was maybe 5’3, even if David was 5’6″ he would have been Betty’s tall brother! Hi Jeanette, Thank you so much for reading and commenting. I actually wrote about the passing of Estelle and Frieda this summer at https://brotmanblog.com/2016/08/11/fallen-leaves/ I am in touch with their children. If you’d like to be in touch, please let me know.